V6: V6 PMP Certification Training Materials for former and current SmartPath LLC PMP Boot Camp Trainees, V6.c. For SmartPath LLC Former or Current PMP Boot Camp Trainees Only - Materials for repurchase or replacement only due to an exam change. This price includes priority postage anywhere in US 48 lower states and Anchorage AK. Leave your address if you live elsewhere so we can get you a postage quote. 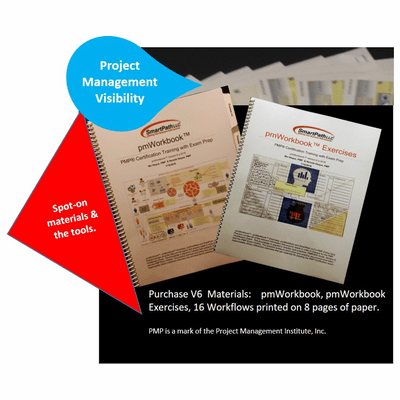 Materials Include: This sale of the pmWorkbook package includes one pmWorkbook and one pmWorkbook Exercises Book and 16 large colorful workflows printed on 8 pages of paper. If you need the online quiz practice also, purchase it later when you are ready for simulated and interactive practice. Nothing else is promised. The New PMP® Exam references the new PMBOK® Guide, Sixth Edition from Mar 26, 2018 going forward. For SmartPath LLC's PMP® Trainees: PM Workflows - Need a replacement? Now you can get just one.